Notes: The firm Lucy visits is the Unique Employment Agency, whose motto is "Unusual Jobs for Unusual People." This concept will be used later in the creation of the Here's Lucy series. Notes: Dan Rowan (of Martin and Rowan's Laugh-in) makes a solo guest appearance as the TV reporter. Notes: This is Ernie Ford's first visit to a Lucy show since his appearances on I Love Lucy. Notes: Singing idol Frankie Avalon is breaking out of his teen mold at this point, trying to appeal to adult music lovers the same way Bobby Darin and Connie Francis have. Notes: Lucie Arnaz does her largest TV part to date. Another important thing happens this week. Lucie Arnaz meets fledgling actor Philip Vandervort, who played a student in this episode. Within a few years, they will be married. Notes: Jack Carter is a close friend of Lucille's. In fact, he introduced Lucille to Gary Morton. Notes: Everyone knows this is the final season for this still very popular series. Less attention is paid to plots and details, and more effort is placed on guest stars and musical numbers. Notes: This is the follow-up episode of the two-parter. After this two-part sequence, the flight attendant plot thread is dropped without explanation, and Lucy is back at the bank as Mr. Mooney's secretary. Notes: This is the second of three times that Lucille trots out old clips and builds a show around them. 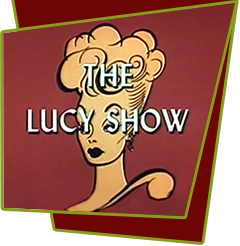 It is already known The Lucy Show is coming to an end, and Lucille wants a sentimental look-back at the show's six years.